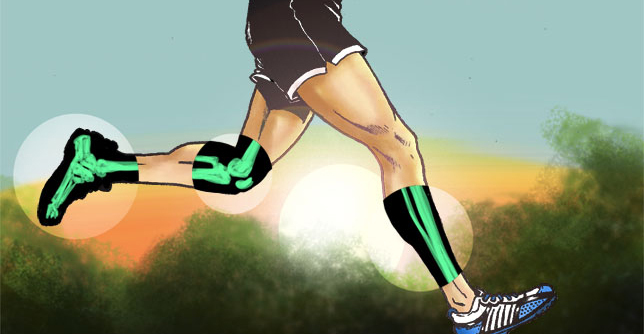 Although running is a non-contact sport, its high impact nature can lead to broken bones, too. Stress fractures is a condition in which tiny cracks in the bone are developed by taxing the leg bones more impact that they can bear. Stress fractures are caused by repeated mechanical stress due to the high impact (and repetitive) nature of running. As a runner, you are more likely to encounter stress fractures in the calcaneus—AKA the heels, the metatarsals—or feet, and most commonly in the tibia—the shin bone. In my opinion, this is one of the most serious ailments that plague runners, making up to six percent of all running injuries, according to survey. In most cases, if you have a stress fracture, you might feel a crescendo of pain that worsens the longer and the further you run but subsides upon rest. Tenderness and swelling of the entire bone are also common indicators of a stress fracture. In advanced cases of the condition, stress fractures will make even the simple act of standing on your feet uncomfortable and painful. Stress fractures do not happen as a result of a fall or slip, they occur as a result of growing strain on the leg bone. The primary cause of this severe bone injury is a drastic increase in mileage and training volume. So if you are over training, then you are more likely to suffer from this condition. Also, runners with nutritional deficiencies and female runners with low estrogen levels are more likely to develop the condition. The first thing you need to do here is rest and give your bones the downtime they need to recover and keep up. Sorry, there is no way around it here. With a stress fracture, rest is the way to go. You can always R.I.C.E to speed up recovery and alleviate pain. In most cases, it might take up at least six to eight weeks to achieve full recovery—depending, of course, on how severe you were injured in the first place. During the downtime, cross train, and wear proper footwear. You can return back to your former running routine once you can jog pain-free with no lingering pain afterward. Once you can walk pain-free, then you might try a bit of jogging or low intensity running. But if the pain persists, then you should back off and build your mileage gradually and slowly. In extreme cases, you might need to run some tests to see if it’s time medical intervention. The best prevention measure is to review your running habits and training to avoid re-injury. In most cases, addressing the root cause of the injury is the way to go. In most cases, try to do the bulk of your running on soft surfaces like grass and dirt trails and steer clear of harder surfaces such as asphalt and sidewalks. Plus, make sure you are consuming enough calories and nutrients—especially calcium to keep your bones strong. You can also improve your bone density with weight training. This entry was posted in Articles, Injury, Running, Sports, Therapy, Treatment by sportsmedicineweekly. Bookmark the permalink.